My research is centred around the production of artwork made for exhibition in the public realm, this may be within a gallery context or other spaces, a wide and diverse engagement with the public is sought and different methods and strategies are employed and carried out. My research seeks to engage the public and ask questions about subject matter, it uses themes of landscape, place and memory while also engaging with other cultural forms such as cinema and written text. I am interested in structures and themes which surround our ideas about place, such as utopian and dystopian spaces and I am looking at both the urban and rural aspects of this. For some time now my interest has been centred on a notion of the ‘Terrain Vague’, this has become an umbrella term involving many aspects of my practice - essentially this is a concern with two elements which are place and agency, these elements are constantly being explored and questioned through my research and output. Terrain Vague could be proposed as a productive zone, one which exists geographically and psychologically, I am very interested in the relationship between these two ‘states’ and how they effect our thinking around contemporary issues such as environment and the individual. and layered practice, one which shifts its material and means in order to challenge notions of established and given forms. This approach can be seen as essential, my aim is for the output to question notions of the recognisable and the sequenced, it aims, to some extent, to disrupt. Graham Gussin uses a wide range of media, including texts, drawings, film, video, sound and installation, to explore the perception of time, space and scale. His works frequently appropriate and manipulate images and literary narratives taken from art history, popular culture and, above all, cinema. His deconstruction of cinematic materials reveals a special interest in film language's structural sediment rather than its narrative articulations. The resulting ambiguity engenders a type of deconstruction of the notion of the sublime, which is questioned through a continuous movement between apparent proximity and effective distance. Currently researching 'Terrain Vague' a research event to be held at SRC, UCL in November 2109. This will be a three day event with invited speakers and an exhibition. It centres around my concerns with territory, agency and landscape. Preparing work for exhibition at Archipelago Art centre, Azores. A major group museum show with 12 international artists documenting work made during residencies there. Current exhibition: Criminal Ornamentation curated by Yinka Shonibare. Touring Arts Council exhibition.Leicester, Wakefield, Exeter and Southampton. Solo exhibition 'The Mary Jane Paintings' opened at Handel Street projects in June. The work consisted of 12 new paintings that have been developed over a ten year period. They take on subject matter such as the history of painting and its relation to notions of the visionary. A text written by Jonthan P Watts was written to accompany the exhibition. This body of work comes out of research made into Walter Benjamin's 'On Hashish' and Sadie Plant's text 'Writing On Drugs' and it considers ideas about content and agency within artworks. Completed a solo exhibition of work made during the Azores residency, held at Fonseca Macedo Gallery in the capital, Ponta Delgada, in October 2018. Work ffrom this exhibition purchased by The Gulbenkian Foundation, Lisbon. Group exhibitions have included 'Inhabit' and 'Now, Today, Tomorrow and Always' both at the Towner gallery, Eastbourne. Also 'Artist's Voices, poster project for the Porto Underground, Portugal. Works presently included in new displays at Tate Britain. Publication of major book: CLEARBLUESKYDEEPDARKWATER from the solo museum show of the same title held at CGAC, Santiago de Compostela in 2013. The book is an overview of works from the past ten years including both short and long essays from many different writes, curators and artists. Solo Museum show at CGAC, Santiago de Compostela. Bringing together of over 25 works including ten new pieces some especially commissioned for the exhibition. Participating on a regular basis in group shows both nationally and internationally. Present: Slade School, UCL. MA/MFA Sculpture. point 4 fte. Imperial War Museum commissioning board. 1992. Serpentine Gallery, London. Public talk on group exhibition. 1997. Slade School, UCL, Contemporary Art Lecture. 1998. Museum of Modern Art, Copenhagen - Robert Smithson in context. Presented a talk on Robert Smithson and time at two day conference. 1998. ICA, London. Panel discussion ‘Art and New Media’. 1999. Artist’s talk, Aarhus Art Academy, Denmark. 2001. Talk on ‘Nothing’ exhibition: NGCA, Sunderland and Warwick University. 2002. BFI, London. Organised by Film and Video Umbrella, London. 2003. Camberwell school of Art. Artists talk. 2005. Art Summer Academy at Tate Modern, Contemporary Video. Presentation and talk. 2010. Barcelona Academy of Art. Artists talk. 2008. Placing Art in The Public Environment. Tate St Ives. Key speaker. 2011. ‘In Conversation’ with Karin Kihlberg and Reuben Henry, Artsway Gallery, Hampshire. 2011. Remote Viewer and other works, Film and Video Umbrella, Ikon Gallery, Birmingham with Jonathan Watkins, Director of Ikon Gallery. 2012. Public talk in conversation with Architect David Chipperfield during exhibition ‘Animated Environments’ at Siobhan Davies Dance Studios. 2012. Falmouth College of Art. Artists talk. 2012. Current Practice, talk delivered to gallery visitors, Roche Sculpture Court, Winchester. 2013. Art South East. Panel discussion ‘Collaboration’ Winchester Hall. 2015. ‘Sequences’ Talk on video works, Sequences Festival, Reykjavik, Iceland.2017. Artist’s talk on work made during residency, Centre Archipelago, São Miguel, Azores. A new commission for Art South, a collaborative work resulting in a solo show consisting of a three screen video projection with sound. The collaboration is between myself, an army camera team and a group of six dancers from The new Movement Collective. 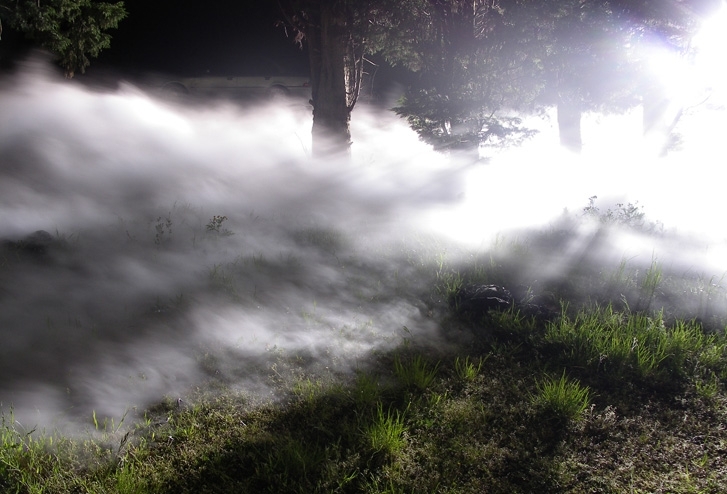 The work was filmed at Longmoor army camp using the camera team and night vision equipment supplied by the army. The dancers responded to this location and the means of recording the event and choreographed a new work around these ideas. What results is a work which collides ideas of movement and choreography and plays with ideas of the seen and unseen while concentrating on the expressive elements of the dance. This work formally develops some interests in night vision and the unseen that I have previously been looking at with works such as 'Night Street Touch' but approaches this in an entirely new way for me, using the evocative nature of the location and recording means to develop a new performative element. A large scale museum show consisting of 15 new works made especially for the exhibition and eleven recent and older pieces. The exhibition consisted of sculpture, text, projections and photographs. A new work 'In Bloom' was shown, a series of three large scale sculptures which occupy a space between formal minimalist traditions and popular cultural references. The forms for these works are based on the abstract form in Durer's 'Melancolia' they take on an animated presence in the space, creating a sense of place and possibility. This was displayed alongside a new wallpaper design commissioned by the museum, also using the same form as its starting point. The intention was to suggest both an external and internal sense of space through the use of architectural form and more domestic decoration. A second large scale piece commissioned by the museum was 'News From Nowhere' , using William Morris's novela of the same title as a starting point it consisted of a steel market stall structure with 18 specially printed posters which visitors could take with them. Throughout the show there were references to notions of utopia and dystopia colliding with more individual ideas of place and purpose using divergent materials and references such as Durer, Morris and 1970's progressive rock music and it's ideologies. These collisions bought about an atmosphere of potential and possibility but one full of tension and , as expressed in the title, a feeling of unease or the uncanny. The exhibition enabled me to develop some established ideas in my practice but also to explore some very new territories. 'Vortex Mix' was a work included here which also appeared in 'Cage Mix', the new context here bringing an expanded sense to the concerns and subject matter of the work. This is also true of the work 'Spill(2006)' and 'Spaced' which were included in this new show. Lens (2012) was a solo show of 22 photographs which was part of a series of solo shows by ten artists under the umbrella title of 'Revolver' at Matt's Gallery, London. 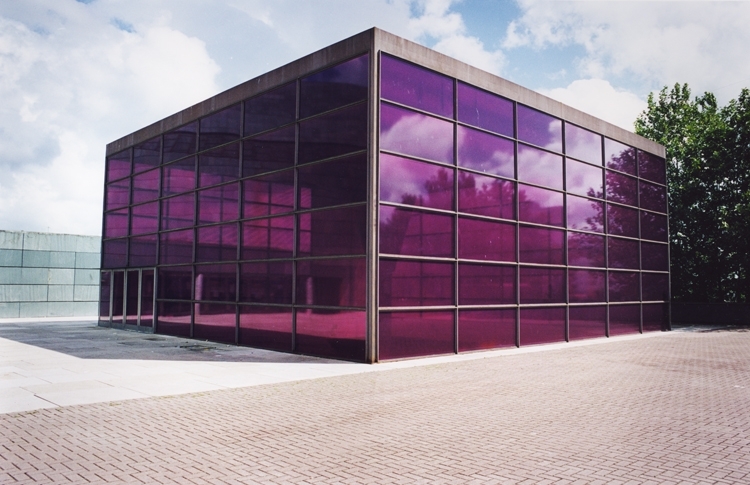 The work consisted of a series of photographs originating in the installation 'AS If' at Art House Foundation in 2011. This was a new work, the previous embodiment of the images was as a slide projection. Consisting of 22 sepia toned photographs taken on location at a hotel on the Atlantic coast in Portugal. The hotel is set close to the furthest western point of Europe, a one time geographic end of the world. The hotel was used as the main location for Wim Wenders’ 1982 film ‘The State of Things’. At that time it was run down and in ill repair. The first ten minutes of his film is shot in sepia tone and depicts an end of the world scenario set in an undesignated future. What we see is supposedly a remaking of the 1955 film ‘Day The World Ended’. The series of photographs revisit the hotel and its surroundings. Shot on 35mm film and printed in sepia, they extend and play on the temporal aspects of the subject. Prophecy, memory and reality become confused through a kind of distorting lens, the photographs acting as a time machine which looks back and forward simultaneously. 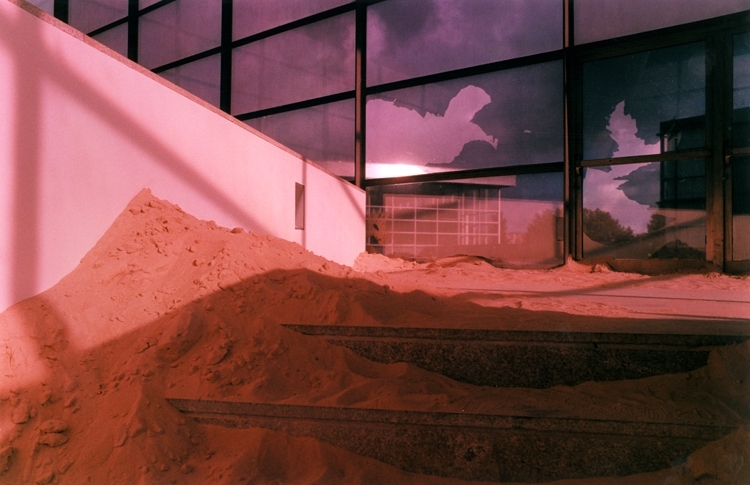 The deserted images have an apocalyptic nature to them, the hotel and environs becoming ruins in a projected time. The Fourth Guangzhou Triennial. A major international group museum show looking at notions of the invisible in contemporary visual practice. I showed five works in the exhibition Including a new version of 'Unseen Film' made especially for the occasion of the opening of the exhibition. An exhibition consisting of five new works with two other works exhibited for the first time, including a new work made for the site. 'Intoxicated Landscape', the new piece, involved the dispersion of alcohol and perfume through the grounds of the exhibition venue, this was then documented and shown as a series of photographs. This work engaged with ideas of trace and with the collision between man made and natural substances, it also played on the idea of a place being overcome through consumption and with a conceptual tradition involving photography and the invisible.A new object based work was produced using 3D printing techniques together with chrome plating. 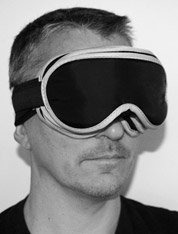 It took the form of a chrome plated sleeping mask, this work gave the show its title 'In and Out, Back and Forth', a hyper visual object transformed from something usually associated with blocking out light, retaining its links with sleep and transport. A solo exhibition of works relating to movement, space and time conceived specifically to relate to the environment of the Siobhan Davies Dance Studios. Consisting of video, sound, photographs, painting and an event based installation at an off-site location. The event based work was a new version of 'Illumination Rig' held in a public urban space close to the dance Studios. This engaged with ideas of stage and movement. The exhibition allowed me to consider connections and aspects of a body of work that I had not had the chance to consider previously, the audience saw a range of works in different media coming together in an unexpected but clear way. Time (tempo) was an important element in the show, the relation between the use of the building, its architecture and the distribution of works within it were carefully considered. A public talk was held at the venue with David Chipperfield addressing the themes of the show, especially the ideas arising from 'Illumination Rig'. This exhibition consisted of a body of new works including projection, sculpture and photography. It developed themes established in my practice, the relation that cinema has to reality and memory, through a particular and focused route. The work generated focuses on a film made by Wim Wenders in 1982 titled ‘The State of Things’. The exhibition ‘As If’ took this film as a starting point for the production of works. A visit was made to the location of the original film shoot, a slightly run down hotel on the Atlantic coast in Portugal, where documentary style photographs of the building and its location were taken on 35mm still film. These were then projected as slides in a sculptural installation consisting of a specially built room and viewing panel. Other works were produced at the location and also shown in the exhibition. The works deal with questions of film time and real time through presenting the images in a way that was poised between archaeological finds and proposed futures. Using the film narrative my research attempted to ask questions about what happens when film images become sculptural and what happens through that transformation. I was interested in the idea that the viewer might ‘inhabit’ the film scenario in an entirely new way through making these translations. The works presented come together as a singular installation which engenders the feeling of place, an important aspect of the original film and the exhibition. 35mm still film was used in the making of the work as this engaged with the original format of the film, this film was developed by myself which linked back to my own emerging practice when the film was shot in 1982. A neon sign which read ‘HOTEL THE STATE OF THINGS’ was included in the show and this linked the ideas to Roberts Smithson’s ‘Hotel Palenque’ a work in which the entropic nature of a hotel building becomes a location to dwell on themes of becoming and disintegration. The images used in the projection aspect of this installation were later printed as a series of photographs, making a new and separate work titles 'Lens' for the 'revelver' show at matt's gallery. Arts council Funded. 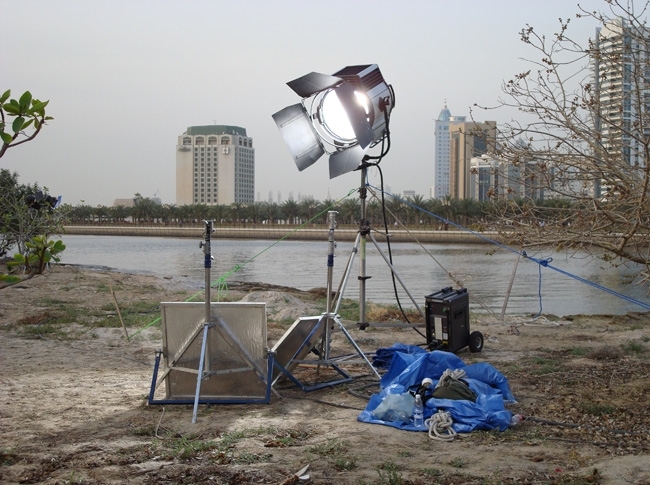 Illumination Rig consists of a film lighting rig which illuminates a given location. The work has been made in four different locations and for the opening of Turner Contemporary in Margate it was very much a new piece, previously the work had lit an otherwise empty or ‘inactive’ landscape, for this occasion the lights were used at a very public and very specific site. This changed the nature of the work in a very interesting and very productive way and led to a reconsideration of the works effect and meanings in this new context. It was very important in the process of this work to consider the architecture of the new building and the fact that the area would be inundated with visitors throughout the period that the lighting rig was in place. ( from 12 am until 12 pm on the opening day). Also it was, of course, important to consider the location which is directly on the seafront. 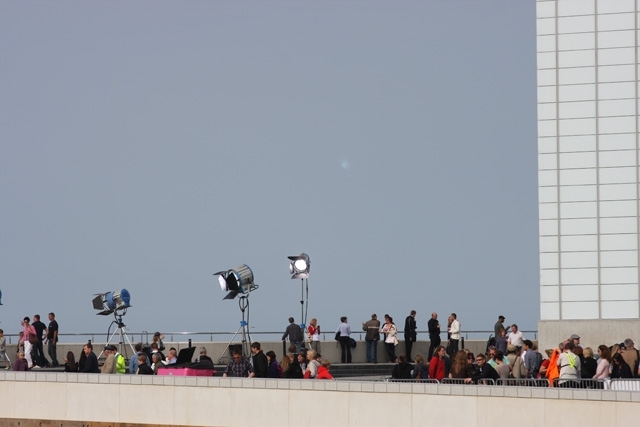 Much discussion was had with the lighting crew members and the staff at the gallery on how to use the rig to draw attention to the people and the landscape and not to just light the new building. This was achieved through careful placement and direction of the light. The lights used have a very sculptural presence and they are a way of orchestrating movement and architecture. The viewer of this work also becomes the subject, on that level the work is interactive as it provides an opportunity to directly engage with it. The work addressed questions of location and event by directly using these as their subject, literally by throwing light onto them. Orientation, focus and subject were bought into question by, for example, having some of the lights directed straight out to sea making visitors acutely aware of their surroundings and the scale of the event. It is felt that the rigour of the piece lies in its simplicity and its use of light as material. Historically the work made great sense for this location, where Turner had once boarded and painted as it was seen to be a way of painting directly onto the landscape. The impact of the piece was to persuade a large audience to consider notions of painting, cinema, history and the reading of a location or situation through the vehicle of the lighting rig. This work has since been made again for the show at Siobhan Davies studio's 'Animated Environments.' The significant difference between these two renderings of the work and the previous versions is pointed out here. I'd like to underline that the specific relation to architecture and movement bought to bear on the work through the relations between dance, space, audience and movement on these more recent occasions transform the piece into a work much more about participation and involvement. The idea of 'situation' becomes much more central and important - and I relate this descriptive term to both the landscape and the engagement of the audience. In Cage Mix I was able to align some of my practice in relation to the work of John Cage. Cage’s drawings were shown in the gallery above and so the relation between visual and aural was a distinct aspect of the show. This had been a concern of mine for some time so one older work was shown alongside a new commissioned wall based work. The work made was titled ‘Vortex Mix’ and brought together some ideas about the relationship between image and sound. It used the cover art from five 12 inch vinyl records spinning at high speed, the images becoming blurred abstract patterns through this method. I wanted to approach the idea that visual and aural information relied on vibration and that this was related to Cage’s thinking on the subject. I wanted also to transform the record covers to a single blur, so that the idea of visual and aural overlap could be expressed, the idea of visual noise being central to my thinking. The subject matter was approached in a very direct way and was successful in its intention to position itself between the visual and sound material, the kinetic aspect of the work constantly reminding the viewer that there was an element of the unrecognisable contained within the work. A second aspect of this piece was to play the five records in the Baltic’s huge stairwell, all five recordings were played simultaneously at the base of this space with speakers placed at different hights through the stairwell. This produced and interesting counterpoint to the visual aspect of the work and took on the architecture of the space which became a resonating chamber. Alongside this I showed a framed work for the first time, another recording titled ‘Threesixty’. This is a framed 12 inch vinyl recording of the sound of a helicopter, it’s frame sealing it from the world of sound. Audiences were able to think of these pieces in relation to Cage’s questioning of what makes music, what does silence consist of and where does one form of perception begin and another end? A solo Exhibition drawing together seven works from my practice plus the production of a new work ‘Film Poster’ Solar is a small museum space which shows the work of artists concerned with film and video, both its production and inherent ideas. The works bought together for this show by independent curator Miguel Perez all dealt with film language, space and time. It was the first time that these works were brought together and was much more than a survey show as it provided an opportunity to consider the work in a new and productive light, the approaches to the same subject using different media being a very important aspect of this. The intention of the show was to demonstrate this rigour of approach while drawing attention to the various means of production enabling a coherent practice to emerge through ideas led work. The relationships between sound, event and process were all explored in relation to each other, any chronology of the pieces was ignored in preference to relations. In this way the viewer was asked to view the show as a cinematic chain of events that could be triggered at any point and in this way the exhibition was seen to be original and new. A new work titled ‘Film Poster’ was made for the town square in Villa do Conde. A large poster listing over 200 possible films was placed on a wall facing the town square. This read as both an instruction, an opportunity for production or a work of poetry. A version of the work was also made as a small printed poster for the audience to take away with them. The exhibition was held at the same time as the yearly film festival that the town holds and so was seen by many alongside new and historical works in the medium. A talk was delivered in the art school in Porto by me which developed the idea of the exhibition.